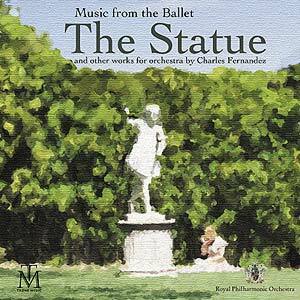 New Release from Charles Fernandez! The work, which consists of a prologue and 9 movements, was commissioned by The Bakersfield Musica da Camera and conductor Gordon Mehling. The original performance of the Work was in 1996 with the Bakersfield Civic Dance Company, choreography by Sanford Smith. While the original instrumentation was smaller (Chamber orchestra), the version presented here is for full orchestra and includes some material never included in the actual performance. I. Opening - Opening on a Statue, there’s more to him than meets the eye. He animates and we see his life with his love before his fateful meeting with the sorceress. II. Sorcery/Transformation - The Sorceress takes a liking to the man, but the love is not returned, for she is evil. Being rebuked, the Sorceress exacts revenge by turning the man into a statue, his mind intact, but his body made of stone. III. Lover’s Lament - His lover appears, mourning the loss of her soul mate. IV. Town Goers Dance (Children’s Dance) - Some time later, the statue has been a fixture in the small town for some time. The statue observes the goings on of the townsfolk. V. Minion’s Town’s Visit - The Minions of the Sorceress happen upon the statue, and remembering the Statue’s origins, run to tell the sorceress of the Statue’s forgotten whereabouts. VI. Lover’s Dance - The Lover reappears and reminisces about their former life together. The man, trapped in the stone body, imagines coming down off the pedestal to once again dance with his love. For a brief moment, they dance together, when the woman realizes the futility of her imaginings she runs off. VII. Minions Dance - The Minion s return to retrieve the Statue for the sorceress, the Lover follows closely behind to try to rescue him. The sorceress, once she appears, is confronted by the lover. VIII. Chase/Sorceress’s Death - The Lover and the Sorceress battle until the sorceress falls to her death. IX. Finale - With the Sorceress’s death, the statue is not yet free, only with the kiss of the lover is the statue freed so they can be together once more. Soldier’s Farewell - A tribute to all of those who have died in service to our country. Windsor Pageantry - Processional for Richard: This work, expanded from it’s original instrumentation of WW quintet, Trumpet and Trombone, was written while studying in London, England for the wedding of my brother, Richard. The Recessional was written in honor of my wife, Tracey, for our Wedding in August of 2001. It was written to express my deep Joy at our final union for life in the eyes of God and our friends and relatives. Amazing Grace for Jazz Bassoon and Strings: There was a period of time that I was playing a good number of concerto performances per year and wanted something unusual to perform that would allude to my New Orleans Roots. This led to my orchestration for Amazing Grace. Once, after a performance in Neu Ulm, Germany, the review was titled, “Bassoon, a cross between a Saxophone and Bagpipes”. Luckily, it turned out he was referring to the encore, and did indeed enjoy it.